If you're in the market for a high-end Samsung phone in the US, you simply have to decide which of the three Galaxy S10 models fits your needs (and budget) best. But if you want a Galaxy mid-ranger, the world's number one handset maker curiously offers very few modern options for its American fans. At least officially, because you can now get the Galaxy A50 or A30 from the same reputable third-party retailer that also stocks Latin America variants of the otherwise inaccessible Huawei P30 and P30 Pro. Like the competition's latest flagships, Samsung's stylish but relatively affordable 6.4-inchers on sale at B&H Photo Video are technically designed with different markets in mind. Nonetheless, you're looking at unlocked GSM Galaxy A30 and A50 units here that should be easy to activate and use on US networks like AT&T and T-Mobile at their full 4G LTE potential. They're also backed by limited 1-year B&H warranties, so unless you're a Sprint or Verizon customer unwilling to switch your carrier, it doesn't seem like you'll be making any major compromises if you buy these "unofficial", US-imported devices. The Galaxy A50 mostly stands out in the photography department, with a triple 25 + 8 + 5MP rear-facing camera setup, compared to the A30's 16 + 5MP dual shooter arrangement. The single 16MP selfie cam on the Galaxy A30 is bumped up to a 25MP unit for the A50, with the latter also opting for a state-of-the-art in-display fingerprint recognition solution instead of the conventional biometric reader mounted on the back of the former phone. Both devices come with Android 9.0 Pie on the software side of things, as well as 4GB RAM and 3.5 mm headphone jacks. Unsurprisingly, the Galaxy A50 packs a snappier Exynos 9610 processor than the Exynos 7904 powering the A30. 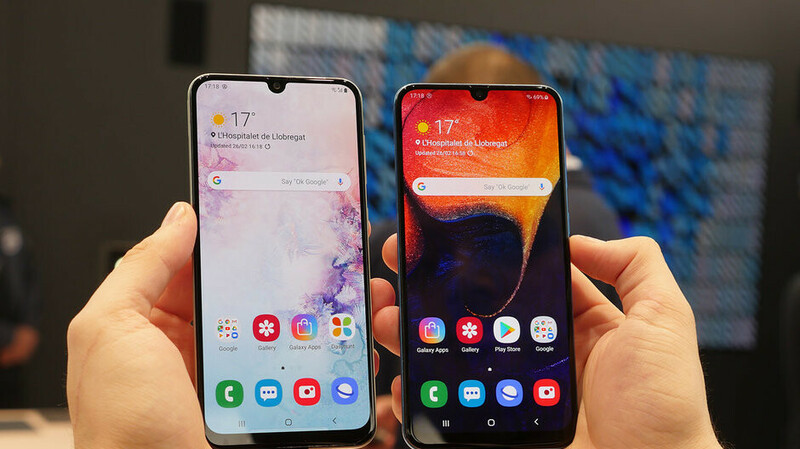 All in all, the value for money doesn't seem half bad as far as either handset is concerned, but if you have a little extra dough to spare, it might be a good idea to wait for the snazzier Galaxy A80 and Galaxy A70. By saying the A50 is the stand out with the triple camera setup, does this mean it takes great photos, comparable to the S10? Or that statement just a "on paper, the A50 has more cameras"? I have the A30 and it’s a great phone, no regrets whatsoever in owning it.